For thousands of years Mediation & Restorative Justice was used by the people of Papua New Guinea as a part of their system of law and justice. This knowledge got almost lost and was rediscovered in the last decades. Pat Howley is one of the most experienced foreign trainers in Mediation & Restorative Justice in Melanesia. During his work on Bougainville in the 1990s he met John Tompot from Siwai, who was still using these methods. Together they worked out manuals and trained trainers, which brought Mediation & Restorative Justice back to the people of Bougainville. 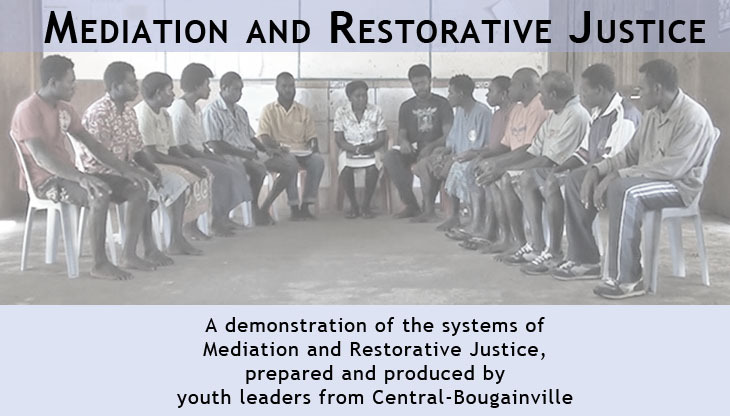 In June 2009 Pat Howley followed the request of the Central-Bougainvillean Youth Leader Team to train them in an intensive two weeks programme in Mediation & Restorative Justice. During this training they prepared and produced this video which demonstrates the methods of Mediation & Restorative Justice.